In 1942, the world was in a terrible state, with the globe engulfed in a conflict the likes of which humanity had never seen. Yet in the midst of that chaos, the governments of the European countries met in the United Kingdom for a conference of Allied Ministers of Education. The war was years away from ending, but those countries were already looking for ways to rebuild their systems of education once peace was established. By the end of the war this idea had grown and expanded, and in November 1945, forty-four countries, including Canada, came together to create an organization that would embody a culture of peace. That organization was UNESCO - the United Nations Educational, Scientific and Cultural Organization. At a time when the world is looking for new ways to build peace and sustainable development, people must rely on the power of intelligence to innovate, expand their horizons and sustain the hope of a new humanism. UNESCO exists to bring this creative intelligence to life; for it is in the minds of men and women that the defences of peace and the conditions for sustainable development must be built. Last week, I was at the annual general meeting for CCUNESCO in Winnipeg. Amongst the regular meetings, there was a visit to the new Canadian Museum for Human Rights and a trip to the Hudson Bay Company Archives (which is inscribed on the UNESCO International Memory of the World Register), as well as discussions on global citizenship and the Truth and Reconciliation Commission of Canada. It was, like many of the meetings I have with UNESCO, inspiring and forward-thinking. And then I flew home to a province determined to tax books and close more than half of its public libraries. I have already written about how that decision makes me feel, but since then I have been thinking about how the work of public libraries fits into the goals and ambitions of UNESCO. Only four years after its formation, UNESCO created what is known as their Public Library Manifesto. It was approved by UNESCO in 1949 and then was updated in Paris in 1994. The Manifesto proclaims UNESCO's belief in the public library as a living force for education, culture and information. It also argues that public libraries are an essential agent for the fostering of peace and welfare. Over the past week, I have seen arguments made on social media and by our politicians that public libraries are somehow old-fashioned, able to be replaced easily by e-books or the internet, or that they are simply not being used by the general public. I have watched people boast about how many years it has been since they have been in a library, and have seen suggestions that those bemoaning the cuts to libraries do not themselves use them. In most instances, these arguments are false, weak, or misdirective. We do this. Public libraries in Newfoundland and Labrador actually do all of these things, and they have been doing them admirably in a system which, for decades, has defunded them, reduced their hours, cut away at their services, and which now threatens to eliminate them entirely in some of our rural towns. This is not the way to build the sustainable communities we need, today more than ever, in our beleaguered province. Today, after more than half a century of existence, UNESCO functions as a laboratory of ideas. This is what we need, now, in this place we call home - a laboratory of ideas. We need more ideas, better ideas, creative ideas, if we are going to save rural Newfoundland and Labrador. Libraries are a key piece, and a vital tool, in making sure that happens. If politicians and ministers of education in the midst of the horrors of World War II could see a brighter, smarter path, surely we can do that today. 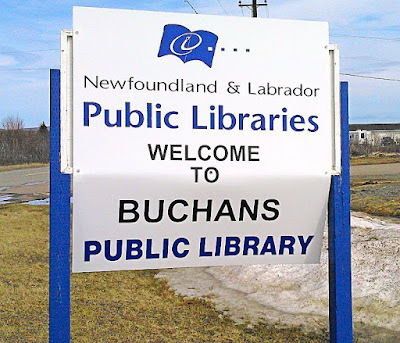 Photo credit: Buchans Public Library, slated for closure in 2016-17. Pauline Dean photo; from Which N.L. libraries are closing (and which aren't). Thanks, Dale, for a beautiful description and defense of the value of libraries everywhere!